The Konica Minolta BizHub C550 is a multifunction printer that features an innovative, revolutionary design to answer the need for slimmer, more compact printers among the multifunction class, while still maintaining its capabilities such as speedy and high-volume production. 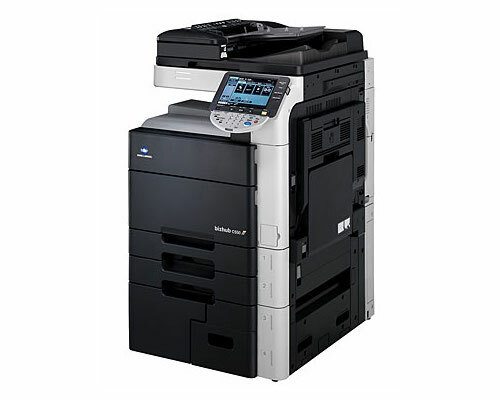 The Konica Minolta BizHub C550 is also an affordable multifunction device compared to other high end products available in the market today, providing cost-effective prints that will surely make offices and businesses, big or small, want to sample this Konica Minolta wonder. The Konica Minolta BizHub C550 prides itself with its 360 styling that makes the machine a perfectly suitable office companion, not to mention that its design also makes it a stylish addition within an office workspace. The Konica Minolta BizHub C550 has a sleek combination of black and silver finish on its body and outer frame with dimensions measuring 25.5" x 30.5" x 45.5" with its control panel included. The BizHub C550, basically an upgraded version of the BizHub 451, having all its features with improved speeds and capacity. It provides lightning printer speeds for both color and monochrome prints, clocking at 45 pages per minute (ppm) and 55 ppm, respectively. Though such speeds are comparable to the BizHub C451, it is relatively higher to what other multifunction printers offer. It uses Emperon Print System, that also allows for seamless multifunction performance aside from improving the machine’s speeds. Scan speed is also at an incredible rate of 70 ppm for full color scans, with scan resolutions at 200, 300, 400, and 600 dpi. Standard memory is 1024 MB, which is shared among its scan, print, copy and fax functions. As an upgraded version of BizHub C451, black and white first copy time clocks less than 4.3 seconds, approximately 0.5 seconds faster to the said model. Copy speed is at the same rate as its print function, with its copy quantity for the BizHub C550 standing at 1-9,999 multiple copies. Magnification for the BizHub C550 is quite impressive, with its zoom function ranging from 25-400% with 0.1% increments, allowing for detailed and impeccable work on images and graphics. Scan function is optional, with Super G3 compatibility at 33.6 Kbps speeds. The BizHub C550 as a high-volume machine offers improved paper handling capacity, with a maximum of 6,650 pages. This includes two 500-sheet universal cassettes, a 1,000 and 1,500 standard sheet cassettes and a 150-sheet bypass tray for handling other media types. It also maintains the standard auto-duplexing function found in most multifunction printers, and a reversing automatic document feeder with a capacity of 100 sheets. Security option for the BizHub C550 is one of its most impressive qualities, providing HDD Job Erase, HDD Sanitizing, HDD Lock function, copy protect, secure printing, IP Address filter and a Biometric Authentication function among other options. Integration is also a feature that makes the BizHub C550 all the more impressive, with its built in bizhub Extended Solution Technology or bEST, for third party software management and integration that included cost controls and network functions. The BizHub C550 does not offer much downside on its end, with its superb functionality and usability. However, with its numerous functions and options that make the BizHub C550 an amazing office machine, these also make the BizHub C550 a complex device, certainly a machine that would need much getting used to. And even though the BizHub C550 has made improvements in its design, it still is a hefty office machine, albeit being stylishly built. Review it: "Konica Minolta BizHub C550 "
The BizHub C550 uses the Simitri HD Color Polymerized Toner for improved quality for prints and copies, whether in full color or monochrome. 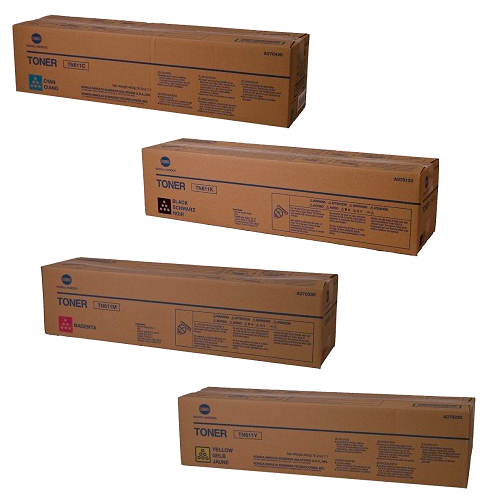 Oil-less toner fusing at lower temperature gives fade-resistant, low-gloss color output in prints and copies. This makes prints and copies much more flexible – one can fold and even write on them without any compromises on quality. Maximum duty cycle per month is improved, with 200,000 pages. 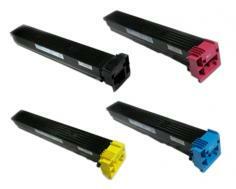 The BizHub C550 toner also allows for cost-effective prints and copies. 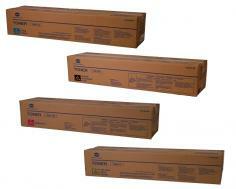 It is also more durable than ordinary printer toners, making replacements quite minimal and easy.